This is the first quarter since Q2 2012 where the FMCG market has not experienced a slower growth rate. 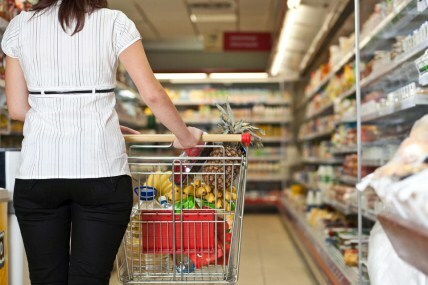 Kantar Worldpanel, the global market leader in consumer panels, reports 7.1% value growth for the FMCG (Fast Moving Consumer Goods) market for the latest quarter up to September 6th 2013 compared to the same period a year ago. This figure is consistent with the growth rate seen for Q2 which means that this is the first quarter since Q2 2012 where the FMCG market has not experienced a slower growth rate. Increases in average prices, as a result of inflation and the continued premiumisation trend, as well as more shoppers, resulting from urbanisation, is driving the value growth. The number of items shoppers have purchased this quarter compared to last remains relatively stable. Lower tier cities in China are contributing heavily to the growth,with 73% of the last quarter’s growth coming from outside of the provincial capitals. The stronger growth has come from shoppers in the lower tier cities putting more items in their basket this quarter. Generally shoppers in higher tier cities will purchase more FMCG items over the year and this trend is now closing the gap. Sun-Art Group is the only key player to have seen significant growth over the last quarter reaching a share high of 8.3%. The group’s growth has been particularly impressive in the East where the share has now reached 16.4% but expansion into South and West is also proving successful with share gains here as well. In China’s 4 key cities competition is intensifying with many smaller retailers gaining share. Retailers such as Lotus, Ren Ren Le and Yonghui have all seen significant growth in the last quarter putting some of the more dominant players under pressure. Mergers and acquisition have now become common place in China’s FMCG retail market and the structure of the market today looks very different compared to 10 years agoThe joint venture between RT-Mart and Auchan in 2011 formed the Sun Art Retail Group and became the largest retail group in China and recently Tesco announced it will form a joint venture with China Resources Enterprises who operate the CR Vanguard Group. This would create a new market leader with an annual share of 8.7%, 0.4 points ahead of Sun Art. Many Western economies are dominated by a few key players who represent around 70 to 80% of the market value and we would expect to see China become less fragmented as the retail industry shakeup is well underway. 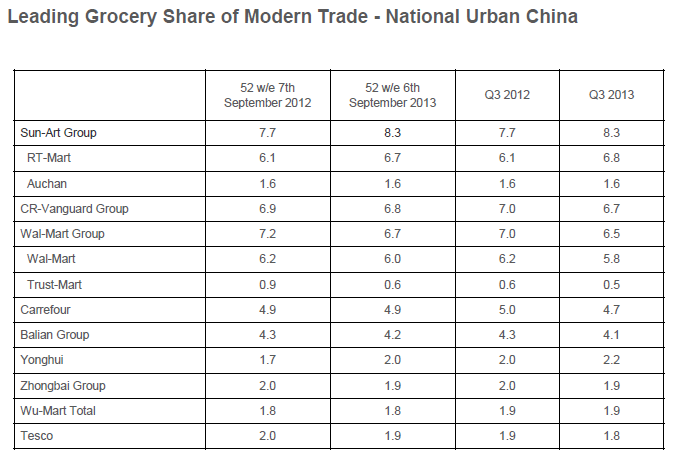 In Q3 2010 40% of the value sales of FMCG in National China was accounted for by 12 retailers. In the latest quarter this number has decreased to 9 retailers as a result of consolidation. On Oct 15th, Wumart has announced plans to acquire 36 stores from Lotus which would give Wumart a 3% share of the national market moving their ranking from number 8 to 6, Kantar Worldpanel predicts. This would allow Wumart to grow their presence in Shanghai and further strengthen their leadership in the North. With the slowdown of retail market and emergence of e-commerce and specialists, traditional modern trade retailers are under significant threats. China will eventually see the dominance of a shrinking number of retailers especially in regional markets as key players are trying to achieve efficiency and competitiveness. We would expect to see manufacturers become increasingly dependent on a smaller number of retailers for sales volume, which gives these retailers significant leverage to bargain for trading terms and also opportunities to collaborate on shopper centric offers.